Drop Stitch Ladder Scarf – Free Pattern! I love playing with new toys, you know, yarn, fabric, new needles….. I saw this yarn and had to buy it. The yarn is a chain yarn – it looks like a crochet foundation chain creating bulk and warmth and is made from a 35% wool, 65% acrylic blend. Then… I had to make something with it and came up with this pattern a while ago. The scarf is warmer than it looks, even with the open drop stitches. I just realised I never shared it on here! So, here you go, enjoy! If you’d like to buy the yarn, I sell it here. 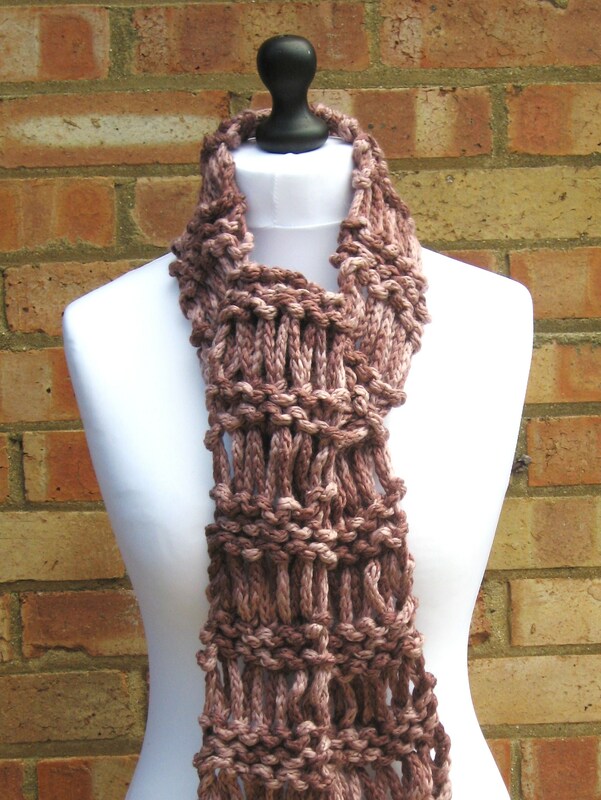 This free pattern* is for a chunky winter scarf made from a superbulky chain yarn. I used 2 skeins of Ice Yarns Superbulky Chain yarn; you’ll need approx. 57M to make yours in another yarn of the same weight. The scarf is 4″ wide and approx. 64″ long. Let me know if you make this scarf – send me a photo and I’ll pop it on here! Click on the link that says ‘download now’. of downloading all the time? An oldie but a goodie… Perfect for when you want a quick knit!